Wildlife: Birdsfoot trefoil is used in wildlife mixes and is an excellent food source for deer. Lotus corniculatus L., birdsfoot trefoil is a short-lived, non-bloating perennial legume which has the ability to reseed itself under proper management. Stems are smaller in diameter and less rigid than alfalfa stems and can grow to a height of 12 to 30 inches depending on whether it is a prostrate or erect variety. Flowers are bright yellow (4 to 8 per stem) with each flower producing one seed pod. Seed pods radiate from the flower stalk, resembling a bird’s foot. Leaves are compound with five oval leaflets. Birdsfoot trefoil has a well developed tap root with numerous lateral branches in the upper 15 inches of soil. There are approximately 370,000seeds per pound. Birdsfoot trefoil is found from the south central United States to southern Canada. It is most productive in fertile, well drained soils with a close to neutral pH. However, birdsfoot trefoil can be grown on low pH (5.5) soils with low fertility and will tolerate short periods of flooding better than alfalfa. It can tolerate periods of drought and is more suited to soils prone to heaving. 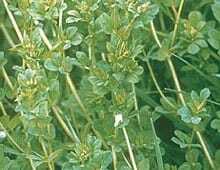 Alfalfa will out produce birdsfoot trefoil by 50 to 80 percent on well drained, fertile soils limiting birdsfoot trefoil to areas where alfalfa is difficult to produce. Birdsfoot trefoil should be inoculated before planting to ensure sufficient nodulation of the root system for nitrogen fixation. A smooth, firm seedbed is recommended. Seeding depth should not be more than 1/4 inch. The seeding rate is 8 to 10 pounds per acre for pure stands and 2 to 8 pounds per acre in mixes, depending on the cool season grasses utilized. Early spring seeding is generally more successful than late summer seeding. When harvested for hay, the first cutting should be taken at 1/10 bloom with a second cutting in mid to late August. To maintain a stand of birdsfoot trefoil, it is necessary to use a management system that provides sufficient regrowth between cuttings and allows the plant to reseed itself. Heavy grazing may be needed in the spring to reduce growth, but close continuous grazing is not recommended because summer regrowth depends on energy supplied by top growth not root reserves like alfalfa. Leave 3 to 4 inches of top growth when grazing. Avoid haying or grazing between September 1st and the first killing frost to allow root reserves to accumulate for better winter survival and spring growth. Birdsfoot trefoil is well suited for stockpiling since it maintains its leaves at maturity and after frosts. Birdsfoot trefoil responds to proper fertility management which should be determined by soil testing.